Newcastle and Sunderland are perhaps not the first cities that spring to mind when you’re thinking of an autumn break. Well, think again … and not just the football lovers amongst you. With daily, 40-minute-long flights from Dublin, Cork and Belfast, there’s no shortage of ways to get there – just a short hop from home. Accommodation is very competitive in several really top class hotels. A quick search on a couple of low-cost airlines for flights in September shows you could get there and back from Dublin for less than €50 – while central hotel rooms start at about £60 a night (your travel agent can put a package together for you). 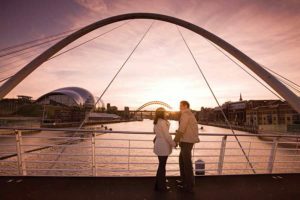 Both cities are only a few miles apart and are steeped in the history of shipbuilding, engineering and coal mining with plenty of museums – but if that’s not your bag, how about shopping and nightlife? You’ll get a warm welcome everywhere you, and the footballing links are well-established – there are entertaining tours to the grounds of Sunderland and Newcastle with guides. Mention Niall Quinn’s name at Sunderland and you will be greeted warmly. Mention Roy Keane and you’ll see a few shrugs. The disappointment is obvious. And how about a punt at the compact racing track at Gosworth, home of he popular Pitman’s Derby, the richest two-and-a-half mile handicap in Europe. The local night life has to be seen to be believed. The Geordies certainly know how to paint the town red and they are delighted if you join them. But beware of a certain brew known as Brown Ale. My father used to call it coffin varnish. He was right. Other local ales are plentiful and are specialties of the North East. Taxis are also surprisingly good value. A special place to eat is Newcastle’s Chinatown (bet you didn’t know they have one!). Here, in streets redolent with interesting smells, you can eat as much as you like at a buffet-style meal for as little as £8. In Sunderland you should dine at “Eauzone Café and Bar” – a popular hunt for Niall Quinn and other Irish football stars (24 Norfolk Street, 0845 644 0101/091 510 3189). You might even spot a WAG or two (they tend to travel in pairs). In Newcastle, “Café 21” at Trinity Gardens on the Quayside is highly recommended. At “Blackfriars Restaurant” (0191 261 5945, reputedly the oldest in England, on the site of an old monastery) four of us had pre-prandials, a four-course dinner with wine and post-prandials for £160 the lot – fabulous value. Your local travel agent, of course, will have more details and will happily put together your travel arrangements, flight and accommodation.